Skansen Kennel was established in 1950 in Sweden, where we bred Standard Schnauzers. In 1970 the Giant Schnauzer was added, after the Kennel was opened in California and very soon after that of course we had to try the Minis. As most of you know, a Miniature Schnauzer may not exceed 14 inches over the shoulder to be shown and their average weight is 15 - 20 lb. There are 3 colors allowed, Pepper/Salt, Black/Silver, and pure Black. Here at Skansen we specialize in the pure black Minis and have built up some very beautiful lines on imported Minis as well as the best in the USA. We take great pride in our dogs - their health, good looks, sweet temperament and long life. All our pups are born naturally - not by Cesarean - and if fed according to our suggestions will have a long, healthy life, without any skin or eye problems. As you can see in our literature we try to breed the very best and our Minis have won Best In Shows in many countries. However we make no claims that our pups are top show pups, or rather we sell our pups as top quality pets as we are very much aware that campaigning a Miniature Schnauzer is difficult and very expensive. To show a miniature Schnauzer to his championship in the USA will cost you a minimum of $3000, usually $5000 - $6000, so we feel that if your intention is to buy a show dog you should turn to the people who actively show their dogs in the ring today. Expect to pay much more for your pup - but these breeders will help you groom etc. and to show a Mini you need help if you are a novice. If you are interested in reserving a giant schnauzer pup, call the kennel to let us know if you want a male or female, pet or show, black or p/s, German, medium or American style. When you narrow it down to what you want, we'll be able to guide you to which pup to pick. If interested in a top show or breeding quality pup, advise us and we'll let you know what is available. Keep in mind that all pups are cropped, which is included in price. We are considered the No. 1 kennel in history of this breed, having bred 1000 + Champions. Restricted registration on all pet females. When I was 10 years old I saved to buy my first dog, which was a P/S Standard Schnauzer female. I have had them ever since. It is now over 50 years since I bred my first Standard Schnauzer Champion. Please let us know if you are interested in one and we will be happy to guide you to a great pup. We have only 3 - 4 litters a year so make your reservation early. 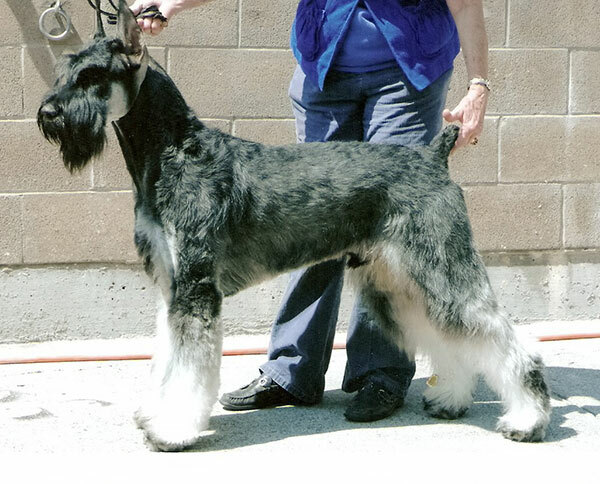 Standard Schnauzers were bred to have a harsh, wiry coat, a little like a Wire-haired Fox Terrier. We do not breed the soft, silky coat in this breed - as we do in Miniature and Giant Schnauzers. In other words our dogs are bred for the correct German style coat - which will get thicker on the legs as they get to be about one year old. We do not have the American style coat in our Standards. If you decide on a Standard Schnauzer, remember they are a big dog in a small package. They are extremely athletic, love to play, and can be very strong, so obedience training is important when they are young. If raised with children, they are great with them; otherwise they tend to be a one man, one family dog. If well cared for, they are a very long lived breed. I know several that have lived to be 16 - 18 years old. They are extremely easy to train, if their owner is firm and consistent and they have the ability to get very high scores in trial work, as they have the intelligence and energy to work all day. They do not shed and have no special genetic weakness.